Enter your zip code in the FastMed Urgent Care location finder to see the walk-in medical clinics near you. Wouldn’t it be so much easier to have a walk-in medical clinic and urgent care in your neighborhood? If you were sick, you wouldn’t have to call for an appointment; you could just walk in and see a medical professional. FastMed Urgent Care is a local walk-in medical clinic that’s open 365 days per year in NC and AZ. 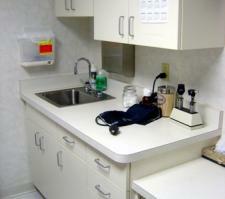 When you go to a walk-in medical clinic, it is always for immediate care. Common conditions like ear infections, allergies, or lumbago are treated at FastMed. We stitch up cuts, x-ray breaks, test for strep throat, do all kinds of physicals for sports and work, and conduct DOT medical certifications. Urgent care should not be confused with emergency care. Emergency rooms are for serious, life-threatening conditions, like heart attack or stroke. If you have symptoms or injuries that might jeopardize your life, dial 9-1-1 and get to a hospital right away. This is not the time for a walk-in medical clinic. Why Choose a FastMed Walk-In Medical Clinic? FastMed Urgent Care locations all have on-site labs, so we do testing in-house. That saves you time and money: no shipping samples over to an outside lab and waiting for results. We have also have digital X-ray equipment at each urgent care facility. We check for injuries, such as a broken leg, or can determine the cause of back or neck pain. Our medical staff includes medical doctors, physician assistants, nurse practitioners, and other medical technicians. What are the reasons we think you should choose FastMed as your walk-in medical clinic? Convenient Location Near Me: You want a walk-in medical clinic that’s easy to get to and open when you need it. It’s bad enough that you’re feeling sick; you should be able to see someone as soon as possible without driving halfway across town. Walk-in Clinic: ﻿Being sick isn’t something you can schedule. Walk-ins are always welcome at FastMed Urgent Care, and you can check-in online. Quality Healthcare: A walk-in medical clinic needs to offer the same quality of healthcare you’d find at any other medical facility. FastMed medical teams are qualified professionals with a compassionate and respectful approach to caring for you health. Affordable Healthcare: At FastMed we take most major insurance plans, including Tricare for our veterans and military families. Plus, we offer the FastMed walk-in medical clinic discount program to help self-payers manage the cost of your healthcare. The convenience of having a walk in doctor nearby is hard to beat, so find the nearest FastMed Urgent Care, check in online, and come see us.